The Valley Railroad's Engine House (built in the 1970's) has received a paint job and a striking new color. All of the rolling stock normally along side the Engine House had to be moved else where for the duration of the project. 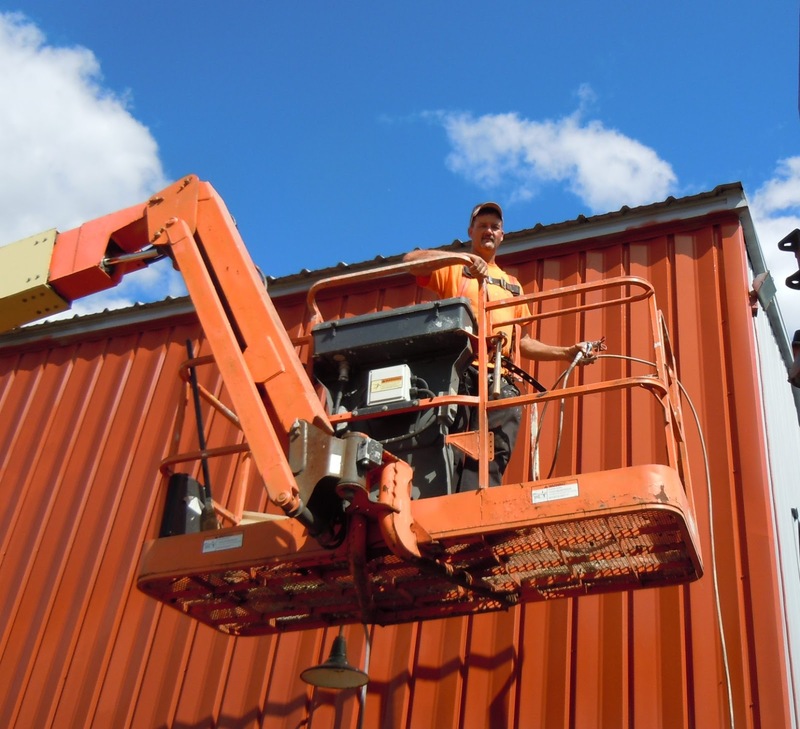 Although the roof of the building has been painted several times, the sides and ends have remained untouched until Facilities Manager Ed Brigman and his crew (Colin Ewart, Bart Hartzell and Liu Jian) washed and scrubbed the building prior to priming and painting. Ed up on the man lift we rented to paint the upper areas of the Dickinson (River Valley Junction) building and the Engine House. 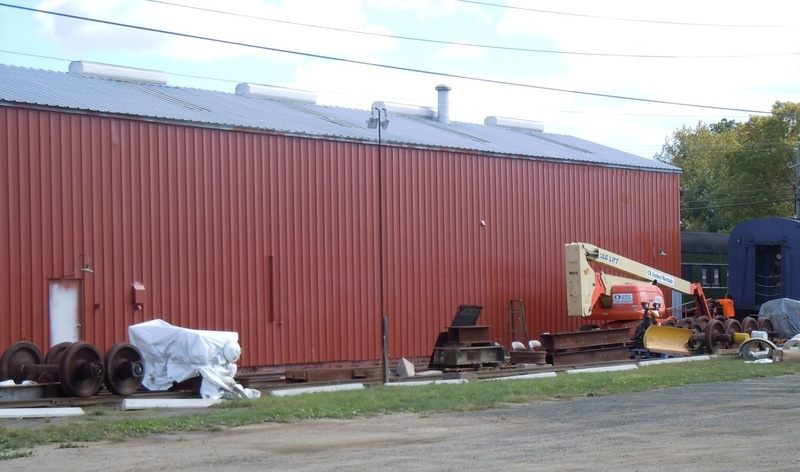 The color was chosen to match the adjoining Locomotive Servicing Facility which was built in 2014. The Friends of the Valley Railroad (FVRR) have nearly finished their restoration of a car with a most unusual purpose: the transportation of automobiles. 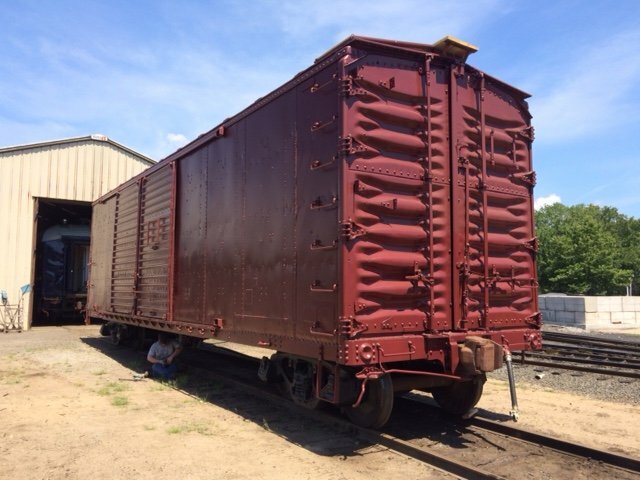 At first glance, it looks like a typical boxcar, however, upon closer inspection it will be noted that it has two doors on each side, a very large set of doors at one end and a curious set of foldable racks inside. The double doors needed to be long enough for a full size auto to fit through and turn during the loading or unloading process. The end doors could be used for unloading where a platform was not available, or a very large vehicle such as a truck was the cargo. The rack system allowed for autos to be lifted up and stowed on an angle so another auto could be loaded under it. Typically, each car could transport up to 4 fully assembled autos. When empty, it could be loaded with any product carried in a standard boxcar, so it’s return trip for the load of autos could produce revenue (unlike modern auto carriers which must return empty for reloading). Left: A brand new Ford sedan is unloaded at Old Saybrook in 1946 using the double side doors. A bit of the rack system that allowed up to 6 autos to be shipped in one automobile car can be seen above the rear of the auto. Right: An American La France fire engine (pumper No.2?) for the Chester Fire Department is unloaded using the large end doors at Deep River in the 1940's. The corner of the Deep River depot can be seen on the left. Photos from the Max Miller Collection. Being restored is former New York Central System No. 54173, built by the railroad’s Despatch Shops in 1930. It was probably used to transport autos from factories in Michigan to other parts of the country. During World War Two when automobile production was suspended, it is likely that it hauled general freight. Beginning in the 1950's, specialized flat cars with multiple levels have been used and most automobile boxcars scrapped, but ours was placed in “company service” and re-numbered X-41276. It had several boilers installed in it and was used as a portable source of steam for heating, perhaps when the boiler in a station or warehouse was being repaired. At some time in the late 1980's, it was retired and sat in an unused storage yard in Bridgeport until it was purchased in January 1992. A hardy crew worked on it for a week under most unpleasant conditions before it could be moved to Essex. A couple of years ago, David Mackay, a director of the New York Central System Historical Society visited and told us that the society occasionally funds projects on NYCS equipment. Paul Costello made application for a grant and earlier this year it was received. The grant will pay for repainting, new roof walks, re-lettering and servicing the air-brake system so the car can be used for special events. The Friends of the Valley Railroad (FVRR) have recently set up an Instagram account @friendsvrr and have been posting photos of the work in process! Way to go, team! What Do You Do With the Ashes? Visitors occasionally ask: "What do you do with the ashes?" Its a fair question given that all coal contains a certain amount of material which won't burn, generally referred to as ash. By law, in the State of Connecticut, the coal we burn must contain less the 2% sulfur. Another characteristic of our coal is that it has a low volatile content, which means it produces little or (if the fireman is doing a good job) no smoke. Since ash generates no heat, it is to our advantage to burn coal which is low in ash, ours generally runs between 8 and 10%, which means that if we burn about 500 tons per year we are left with about 50 tons of ash per year. So, what is done with the ash? Years ago, the railroads used it on their tracks for fill and ballast (e.g. - the Lyman Viaduct in Colchester). Today, it goes back where it came from: the coal mine. A couple of times per year, the truck that brings us a load of coal is loaded with ash which is returned to the mine. The Middletown (formerly known as Carolyn) is receiving finishing touches to its interior. Earlier this year, restorationist Alex Cielo painted the interior moldings a contrasting, yet complimentary color. 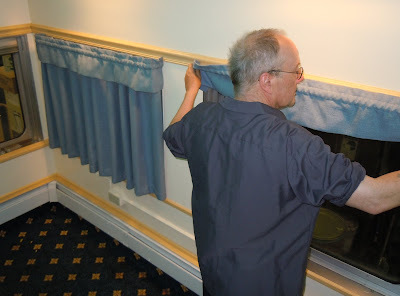 Gail, from Lombardozzi Interiors, made curtains for all of the windows using a blue fabric, often used on fast trains such as "The Royal Blue", which harkens back to the car's days as Baltimore & Ohio "Capitol Road". Here, Bill Wolf has mounted all of the brackets needed and begins to hang the curtains. 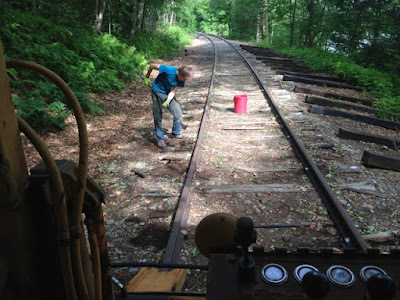 When Chip Mahoney, an 18 year old senior at New Canaan High School approached Valley Railroad Shop Supervisor Wayne Hebert about the possibility of a summer internship, Wayne was a bit skeptical, it is unusual to find young people who want to work on steam locomotives per se, and it would mean a nearly two hour drive each way. But Chip is an unusual young man. 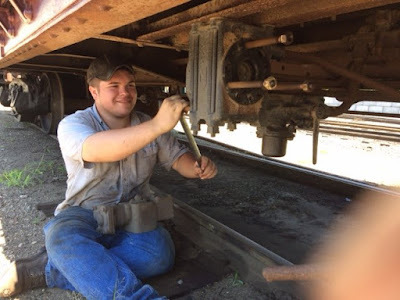 As he put it: “I found myself interested in railroading at a very young age. My parents took me to a 15” gauge miniature railroad in the Berkeley, California foothills one day and I was hooked from then on. Eventually I started to volunteer there, doing track work and later locomotive maintenance. Even at that young age I was captivated by the moving parts, slowly escaping steam, and the people who ran and maintained the equipment”. “In the steam world you have to do a bit of everything. For the most part my skills as a machinist, welder and general mechanic are self- taught. I read a bit, and try to teach myself how to do something for a specific project. It’s a very “learn as you go” method”. “I currently attend New Canaan High School. As a graduating senior, the school offers an internship program to students who wish to have practical work experience in the field that they are going to pursue after high school. I approached the Valley Railroad about a possible partnership with the school program and was greeted with enthusiasm for my participation”. “It has been a fantastic experience to work with everyone at the railroad. They are like a family, where everyone helps one another with whatever is needed, and more importantly, everyone loves what they do”. Think ahead: Look at how to make something easier down the road. Simplify large projects: Break down large projects into smaller steps so they are more manageable. Finish one step before starting another”. Wayne summed it up nicely: “This has been a beneficial experience for all concerned, Chip’s enthusiasm is contagious and he has made a meaningful contribution to the restoration of No.97. 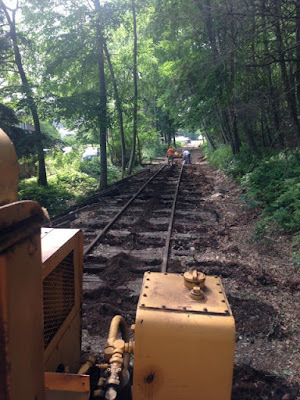 The Friends of the Valley Railroad have been busy doing crosstie renewal up in Haddam, just north of Midway Marina. The team has been working hard, mostly by hand, to bring this track back to life, having not seen regular train service since 1968. In the background is Midway Marina; once they have all their boats in the water, the VRR track crew will get to work unearthing the track in the vicinity of the marina to connect active track with the portion the volunteers are currently working on. The yellow machine (a track bed scarifier) was dragged across the gravel through the marina, as the rails are buried beneath the gravel. The scarifier loosens the ballast material between the ties, then it's all hand work to dig out the ballast, jack up the track, remove the deteriorated tie, and pull a new one in by hand. Then the tie is "tamped" to make it solid, plated, then spiked. A time-honored process! As this track is opened, it will be used by the Essex Clipper, the Haddam Special Foliage Excursions, and the upcoming Eagle Flyer. During a landscape project last week, we were surprised to discover an ancient boiler buried in the ground. The boiler is typical of the type used in small factories of that era, such as the birch oil mill adjacent to where it was found. The mill was recently repaired in a joint effort by the Essex Historical Society and the Essex Steam Train & Riverboat, and re-dedicated as the "Yellow Label Mill". The railroad stabilized the building, put on a new roof, and painted / replaced windows; the historical society refurbished signs and created panels that will tell the story of the factory. The Yellow Label Mill was known as the Birch Mill. It was built in 1915 and used until 1927 to distill and bottle oil from Black Birch twigs. It was reopened briefly during World War II when synthetic birch oil became unavailable. The great thing about the Birch Mill was that the owners stopped using it, but left it fairly intact. “It was like they locked the building and walked away. It’s virtually a time capsule of industrial history from 100 years ago.” says Essex Historical Society Director Melissa A. Josefiak. We believe this to be the only remaining mill of its type in existence. First Train in 48 Years! Evidence of our on-going restoration of the line northward for enhanced viewing for the Essex Clipper Dinner Train, the Eagle Flyer, the Haddam Special Fall Foliage Day Trip, and other future scenic opportunities in Haddam. The current limit of operable track is nearly adjacent to the popular Blue Oar riverside restaurant, with more to come in the very near future. This line extension north of Goodspeed Station (Route 82 /Bridge Road) has already provided stunning views of the Connecticut River, East Haddam Swing Bridge, historic homes overlooking the river in East Haddam, eagles dining from holes in the river ice, and the confluence of the Salmon and CT Rivers. This extension has been the culmination of years of hard work by the dedicated Friends of the Valley Railroad, working under the guidance and supervision of The Valley Railroad Company. The project is entirely privately funded - no public monies are being used on this project. For folks that want to see or photograph the Dinner Train at this new northern stopping location, we kindly ask that they respect the private property of the adjacent marina. 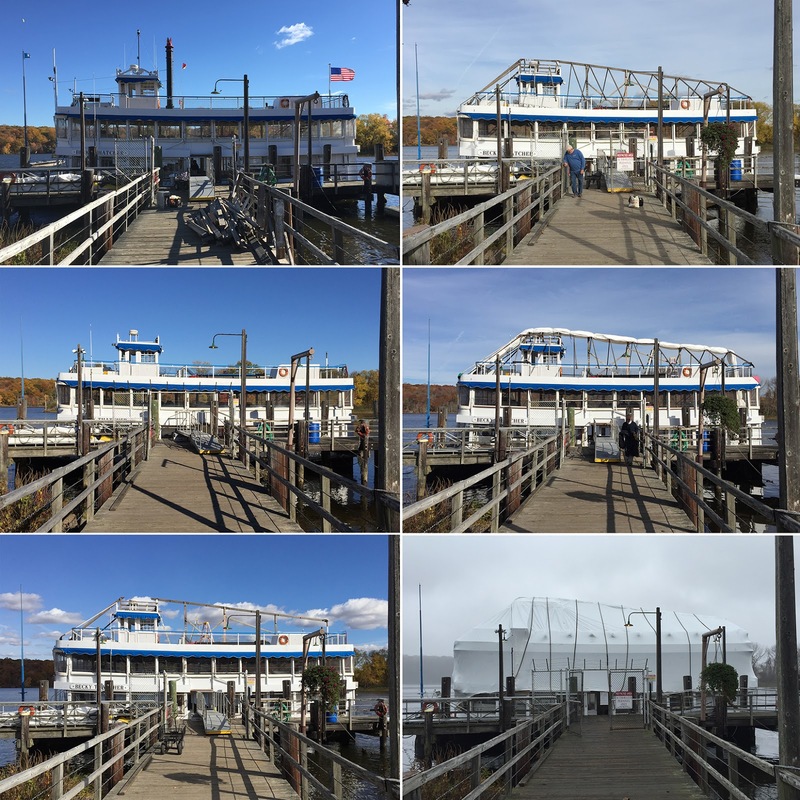 Ever wondered what we do with our riverboat, Becky Thatcher, during the winter months? She stays at our dock in Deep River, covered and shrink-wrapped where we do maintenance all winter. Every fifth winter, she's taken to a shipyard where she gets hauled out for a routine hull inspection. In addition to winterizing the engines and water lines, here's how we break down and cover the boat when she's going to be sitting at the dock for the winter. Thanks, Captain Paul, for the write-up and the foresight to grab this photo sequence! News and Updates from the Engine House, at the Valley Railroad, in Essex Connecticut.